Unwrap your candy canes and chocolate bars. 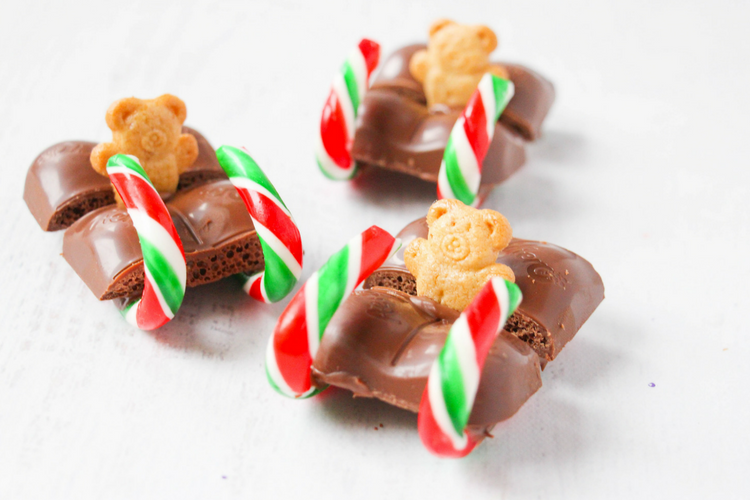 Cut the chocolate bars so that two portions can fit on the long end of one of the miniature candy canes with a Teddy Graham in the center. Group 2 candy canes, 2 chocolate portions, and 1 cookie for each Sled. Melt the remaining chocolate in a microwave-safe bowl for 25 seconds, stirring well before reheating if necessary. Hold a candy cane with the hook side up and the long side flat against your work surface. Add a small dab of chocolate to the bottom of the inner hook and place a chocolate portion on top. Add a small dab of chocolate to a second candy cane and balance the chocolate portion between the two. Add a dab of chocolate to the back of the candy cane sleigh (on each candy cane) and add the final chocolate portion. Dip the Teddy Graham cookie in chocolate and insert it in between the chocolate portions - moving them closer together if needed to hold the cookie in place. You may need to hold the candy canes in place until the chocolate sets a bit, to avoid them from moving.